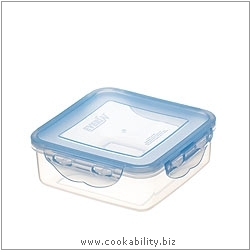 The Pure Seal range of storage containers from Everin are 100% airtight and watertight. Versatile, durable and hygienic. The silicone seal contains antibacterial Nano Silver particles that kill harmful bacteria, keeping food fresher for longer. Four locking hinges for secure fitting and quick release. Stackable design saves space in cupboards, fridges and freezers. Pollution free, pure materials and no environmental hormones, ensuring food safe plastic.